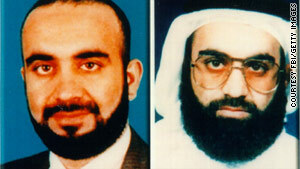 Alleged 9/11 mastermind Khalid Sheikh Mohammed is among those suspects set to face a trial in a civilian criminal court. Washington (CNN) -- The Justice Department remained tightlipped Friday as criticism mounted over the decision to hold the the September 11 terrorist attack trial in a civilian court in lower Manhattan. Earlier, senior Obama administration officials confirmed that the White House is considering moving the site of the trial if the Justice Department sees fit. "Conversations have occurred within the administration to discuss contingency options should the possibility of a trial in lower Manhattan be foreclosed upon by Congress or locally," a senior administration official said. Justice Department officials refused to acknowledge whether they are being pressed to find an alternative location, despite bipartisan concern that holding the trial in Manhattan would be too costly and disruptive. "We're reviewing our options," said Justice Department spokesman Dean Boyd in a statement Friday. The administration's turnabout comes after New York Mayor Michael Bloomberg and other politicians expressed great concern over the costs and disruption of holding the trial of Khalid Sheikh Mohammed and four accomplices at a courthouse near Ground Zero in lower Manhattan. White House officials said President Obama agrees with Attorney General Eric Holder's decision in November to try the suspects in a civilian criminal court in the United States, not a military tribunal. "Currently our federal jails hold hundreds of convicted terrorists, and the president's opinion has not changed on that," White House spokesman Bill Burton said Thursday. One government official close to the case said other New York locations, including a military site on New York Harbor's Governor's Island, are possibilities. And while Virginia sites also were mentioned as alternatives by former counterterrorism officials, Virginia Sen. Jim Webb, a Democrat, opposed moving the trial to his state. "Bringing enemy combatants for detention or trial in Washington, D.C., or Northern Virginia would unnecessarily burden these communities from both a financial and security perspective," Webb said. New York police estimated the cost to the city would be over $200 million per year in what could be a multi-year trial and that over 2,000 checkpoints would need to be installed around Lower Manhattan. Police Commissioner Ray Kelly said additional protection would have to be deployed for the city, not just the core area of Manhattan. Residents like Pat Moore contemplated what it will be like to live through the trial. "Those people would virtually be held prisoner in their homes," Moore said of New Yorkers who live near the courthouse. "We've all been traumatized, any of us who were there that day" referring to September 11. But this week he used different rhetoric when asked about a community agency's proposal's to relocate the trial, saying he would prefer the trial be held elsewhere, perhaps at a military base where it would be easier and cheaper to provide security. On Thursday, a group of New York politicians urged the Obama administration to thoroughly re-examine locating the trials in downtown Manhattan. "We are concerned that the administration has not fully considered the impact that the trials would have on lower Manhattan in choosing the Moynihan Courthouse in Foley Square," U.S. Reps. Jerrold Nadler and Nydia Velazquez, both Democrats, and several state and local officials said in a letter dated Thursday to Holder. Also, a spokeswoman for Gov. David Paterson cited his "hesitation" with the decision, citing the burdens it would pose on city residents. A spokesman for U.S. Sen. Kirsten Gillibrand raised financial concerns, saying her "single biggest concern is making sure that the federal government cover the hundreds of millions of dollars per year cost to New York City for security during the trials." Julie Menin, chairwoman of a city community advisory agency, proposed four alternative locations for the trial within the Southern District of Manhattan: Governors Island, Stewart Air National Guard Base in Newburgh, the U.S. Military Academy at West Point, and the Bureau of Prisons jail complex at FCI Otisville. Some U.S. senators -- including Homeland Security Committee chairman Joe Lieberman, I-Connecticut -- want the detainees tried in military commissions. A letter from one group of senators said a federal civilian trial would provide militants with "one of the most visible platforms in the world to exalt their past acts and to rally others in support of further terrorism." One congressman, U.S. Rep. Frank Wolf, R-Virginia, is planning to introduce legislation that would cut off funding for the trial and block transfer of the September 11 suspects to New York. President Obama is "committed to seeing" Mohammed, the mastermind of the attacks "brought to justice," Burton said. "Khalid Sheikh Mohammed is a murderous thug who has admitted to crimes ... some of the most heinous crimes ever committed against our country," he said. CNN's Suzanne Malveaux, Terry Frieden and Cassie Spodak contributed to this report.